Multiple File Protection for Excel can protect or unprotect multiple Excel worksheets and workbooks automatically in a fast and simple manner. The Multiple File Protection for Excel automated protection and unprotection process provided by Multiple File Protection for Excel can save considerable time. Features include choosing an entire directory and protection password options. 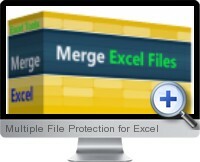 Protect sheet in Excel files. Unprotect sheet in Excel files. Protect multiple sheets in Excel files. Unprotect multiple sheets in Excel files.